Whether or not you bike to work, there are a lot of great ways to sneak a little bike time into your routine. Riding a bike doesn’t mean that you’re required to squeeze into a skin tight racing suit or pull on an old pair of athletic shorts, but that’s easy to forget when we think about biking only for exercise rather than as a fun way to get from Point A to Point B. Personally I love fashion and can spend hours putting together the perfect look. But I still hate having to change clothes throughout the day just because I find myself doing different activities. Ideally, I would wear just one outfit that takes me to the office, client meetings, happy hour, and my commute. 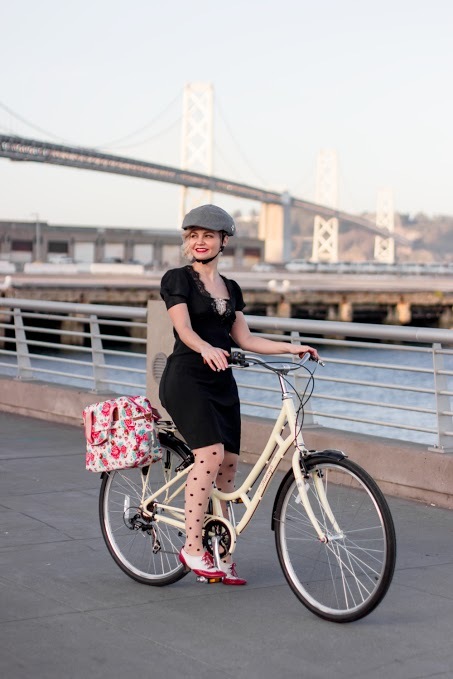 While this style of dressing is a little extreme and might not be practical for everyone, this self-imposed constraint has meant that I’ve learned a lot about how to bike in style. Now that I’ve picked up a few tips, it’s actually pretty easy to pull off. Once you start, you’ll realize how it is simpler to dress for your destination instead of your ride, especially if you are heading out to see friends or meet a special date. While biking is excellent exercise, it can also be a lazy form of fast walking. A bike has this magical way of shrinking a fifteen minute walk into a five minute ride. That said, if you’re on your way somewhere and don’t want to arrive dripping sweat, remember not to push yourself. Slow down and enjoy the sights and sounds of your neighborhood. You might not make every light, but that’s all right. You’ll reach your destination without overheating and be ready to make a great impression. This is the best piece of advice I have ever heard regarding temperature regulation on a bike: if you’re warm enough during the first ten minutes of your ride, then you’re overdressed. It’s really true! A spring evening might still be “jacket weather” but don’t bundle up just yet. Bring your outerwear with you, but ride in your shirtsleeves. After moving your legs for a few moments, you’ll start to feel warmer and you might even work up a little sweat. Going without a jacket gives your body a chance to regulate its temperature and also lets your clothes breathe so that you don’t feel clammy. And if you’ve found that you just couldn’t help yourself from attacking those hills and end up sweating through your shirt, once you arrive, you can still pop on your jacket and your sweat stains are hidden away. A lightweight road bike that is stripped down to the essentials is great for weekend group rides in the countryside. But if you’re using it to get around town, you’re probably going to want to carry a little bit more than a water bottle and a few sport gels (or in my case chocolate bars). As much as possible, avoid carrying heavy stuff on your back. Loaded up messenger bags and backpacks trap sweat against your body, wrinkle your clothing, and generally strain your back. 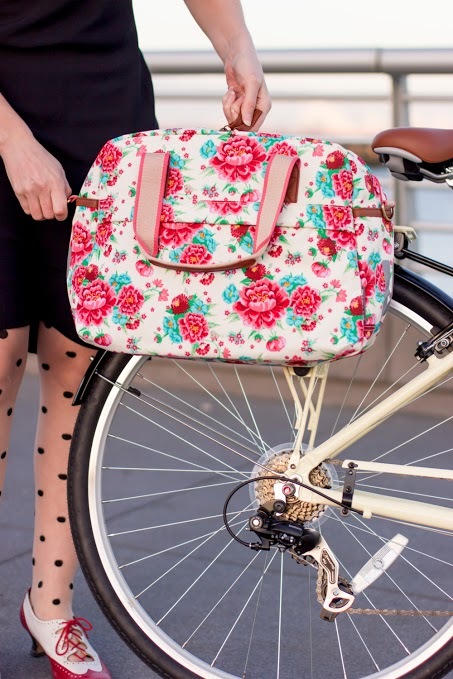 A detachable pannier on a rear rack, a frame bag, even a handlebar bag that stows a quart of milk--or a bottle of wine--will go far in helping you ride in comfort. And if you don’t feel good, you won’t look good! I don’t have a lot of must-haves for bike rides (besides lights, a lock, and the bike itself) but there are so many occasions when a well-placed wet wipe has saved my bacon. If you’re feeling self-conscious, you can wipe your armpits for a quick refresh. Use them to wipe the grease from your hands if your chain pops off. A small pack of 20 or so can be stowed discreetly under your saddle. HELPFUL HINT: If you get bike grease on your clothes, squirt a little undiluted dishwashing or hand soap onto the fabric. Don’t add water. Instead work the soap into a lather until the stain has almost disappeared. Then rinse and launder as usual. Whether you’re enjoying a serene rails-to-trails ride or biking home at rush hour, riding is just a lot of fun. Any day with a bike ride is a good day. Remember how much fun you had as a kid biking around the neighborhood? Even though you’re all grown up, it’s still just as much fun. So don’t forget to enjoy it!